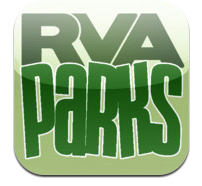 RVA Parks was created by the City’s Department of Information Technology following a review of smart phone usage to access city parks information on the Department of Parks, Recreation and Community Facilities website. The application can be used on Apple iPhones, Apple iPads and Android phones. The application is available for download in the Apple Store or in the Google Play Store. To view a tutorial on how to use the RVA Parks application, please visit: RVA Parks. RVA Parks also provides a new mobile medium to communicate with the City about the parks system. City residents can report issues using 3-1-1 and the Citizens’ Request systems, and now they can use RVA Parks as well. Residents now have the ability to provide parks and facilities feedback to the City and report concerns by taking a picture and sending it by email directly from their smart phone.